In 1920, noted architect Anton Scherrer wrote a short piece titled “The Three Best Houses in Indianapolis, Indiana” for House Beautiful magazine. Among the choice subjects receiving his praise was a stately home located at 1500 N. Delaware St. occupied by a noted author. Nearly 100 years later, thousands of people continue to parade by the Meredith Nicholson House each week – in cars, on bicycles and on foot. And no doubt, like Scherrer, a good number of them continue to admire its dignified beauty. 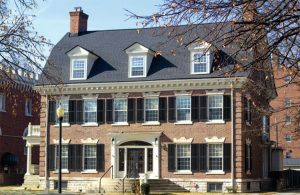 Today the house serves as the headquarters for Indiana Humanities, a nonprofit which coordinates an array of statewide programming from under its roof. To better carry out its mission, the organization undertook a significant restoration of both the exterior and interior spaces in the summer and fall of 2017 – and the house now looks better than it has in years. 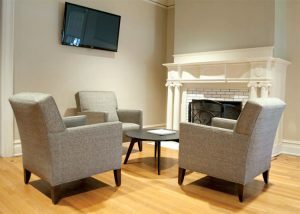 The Nicholson family’s “visitor’s room” now serves as a coworking space for Indiana Humanities. With its rich history, the house is worthy of such meticulous stewardship. Indianapolis architect Herbert Foltz designed the house, purportedly the first Colonial/Georgian Revival home in the city, and the Nicholson family moved in in late 1903. Given Meredith Nicholson’s stature, the home was a center of entertaining, and prominent people often visited, including fellow Hoosier authors James Whitcomb Riley and Booth Tarkington. Nicholson wrote his best-selling book, The House of a Thousand Candles, in the third-floor study in 1904, and today the house has taken on the book’s title as a moniker. After the Nicholsons sold the house in late 1920, a second family used it as a private residence. By the early 1930s, however, the neighborhood was changing. In 1933 a funeral home proposed buying it but backed off after public outcry. Instead, a woman named Mary Keller purchased it and christened it Meredith Manor. For the next few decades she operated it as a boarding house, and for several years her brother operated a doctor’s office from the house as well. By the 1970s the deteriorating condition of the house caught the attention of Indiana Landmarks, and in 1978 the preservation organization purchased it. After extensively rehabilitating the exterior, Landmarks sold the home to Bob Beckmann, a well-known figure in the city’s civic and arts communities. Beckmann fixed up the interior and lived in the house for seven years before selling it to Indiana Humanities in 1986. 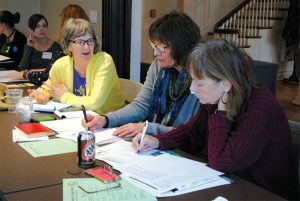 From its Old Northside home, Indiana Humanities develops and implements award-winning public programs in all four corners of the state, with the goal of encouraging Hoosiers to think, read and talk. 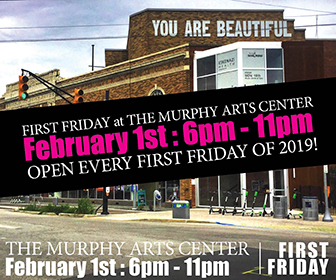 Recent programs include statewide community reads and festivals that celebrate the bicentennial of Frankenstein, field trips that incorporate environmental literature and hikes through the state’s natural areas, a popular summertime bar crawl featuring topics from Indianapolis history, and much more. With 10,000 square feet of space, the house also offers room for tenants. Three organizations – Central Indiana Land Trust, CODO Design and the League of Women Voters – rent offices there. 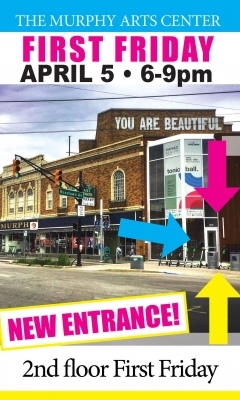 As Indiana Humanities wraps up the renovation work, passersby will note a much-improved front façade. Crews carefully replaced crumbling bricks and mortar and gave the house a good power wash, clearing away grime and giving it an overall brighter appearance. One of the most notable pieces of the project was the restoration of the “battalion” of historic windows along the front of the house. Craftsmen removed the entire windows and dismantled them, carefully restoring and replacing the individual panes of glass and the strips separating them. After they reassembled and reinstalled the windows, crews added new shutters. about to remedy that. The newly rebuilt porch looks much like the original 1903 version, with ionic columns and railings, but also with modern additions such as adjoining terrace for entertaining and ramps that make the home ADA accessible. Increasing public access was also key to interior renovations. An important goal was to make the first-floor rooms more inviting. The former library now serves as a meeting room, and what the Nicholsons referred to as the “visitors’ room” is now a co-working space. Both rooms feature restored hardwood floors, freshly painted walls and new furnishings. Groups may use the meeting room free of charge during business hours, and the coworking space is open to anyone who’s looking for a place to relax and catch up on work, whether it’s for several hours or just a short time between engagements. 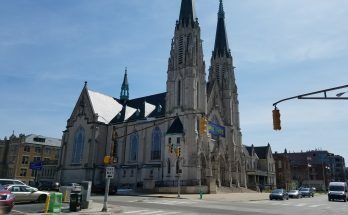 Other major renovations on the interior include a completely rebuilt kitchen that’s now well suited for catering and an enlarged restroom that’s ADA accessible. Reconfigured offices on the second floor allow Indiana Humanities staff to better carry out their work. 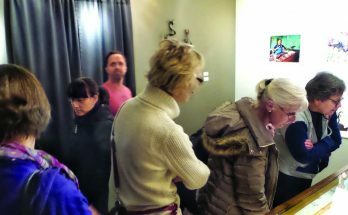 “We undertook these renovations for two key reasons,” Amstutz pointed out. “First, it was important to us to continue to preserve this very important landmark so that it remains standing for future generations to enjoy. Second, we truly want to make this a community space where people can gather to share ideas, discuss important issues, learn new perspectives and connect with others. 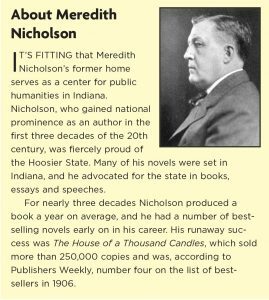 For information on using the Meredith Nicholson House’s meeting space, call Indiana Humanities at 317.638.1500 or email info@indianahumanities.org. 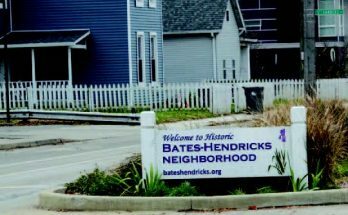 Indiana Humanities acknowledges Lilly Endowment Inc.; the Efroymson Family Fund, a fund of the Central Indiana Community Foundation; the Nicholson H. Noyes Jr. Memorial Foundation; and Indiana Landmarks for providing funds to assist with the renovations.